Japanese Episode AG 019: "Dasshuu! Samehadaa no Shima!!" 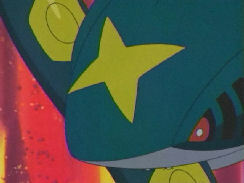 American Episode 291: "Sharpedo Attack!" Now that Satoshi-tachi has a ride with Hagi-Roujin, the group heads toward Muro Town. Haruka, Takeshi, and Masato manage to convince Satoshi to rest for a bit to swim, so Hagi drives the group to an unknown island. Along the way, they are attacked by a group of Samehadaa, but the boat is able to get away to the island. Once there, everyone worries about how they'll get past the school of shark-type pokemon, and Takeshi develops a plan to take out the leader in order to weaken the group. Meanwhile, the Rocket-Dan is attacked by the school, and before they are sent blasting off Musashi's Habunake manages to poison the leader of the Samehadaa. Back on the island, Satoshi-tachi are able to corner the head Samehadaa into a one-on-one battle, but the shark pokemon proves to be much weaker than expected. Takeshi determines that the pokemon has been poisoned and stays up with it all night to nurse it back to health, all the while gaining the shark pokemon's trust. The next day, the Rocket-Dan attempt to steal both Pikachu and the leader of the Samehadaa, but the rest of the school is able to rescue them and send Musashi-tachi blasting off again. 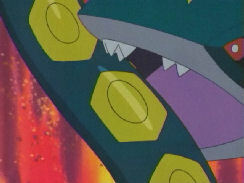 The shark pokemon decide to let Satoshi-tachi pass, and soon the group arrives in Muro Town. Hagi-Roujin heads off to Kaina City and leaves Satoshi to battle for his next Gym Badge. So now that the group has a ride to the next town, we get an episode watching them get from Point A to Point B. And for what it's worth, it's pretty entertaining. I liked how the episode made Samehadaa out to be this big bad pokemon and how, for the first time in a long while, the group was actually in real danger. A lot of people will dismiss this episode as just another filler episode, but the pacing of the series would be awkward if they went from "On a Wingull and a Prayer!" to "Brave the Wave" without this episode. Just think of this episode as covering Route 105 from the games. Polka O' Dolka replaces Soko ni Sora ga Aru Kara as the ending theme as of this episode in Japan. It's a fun little song that will eventually be heard in the dub of the mini-movie that accompanies the first Advanced Generation movie. When I was doing the comparison for this episode, I noticed that there was no time cut at the beginning of the episode. So I guessed that there must be a content cut elsewhere in the episode to make up for it. And I guessed correctly. 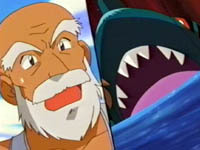 When the Rocket-Dan is being attacked by the Samehadaa, there is a two-second shot of the shark pokemon biting on Habunake's body that is cut out from the dub. 4Kids actually does a pretty good job of cutting the scene out without leaving any noticeable gaps in the music (since they do use the original music in that particular scene), so you can hardly tell that anything was cut at all. But my question is; why was anything cut? We've seen tons of pokemon being bitten in the past before, so why is it so taboo now? A second-long shot of the sky after the Rocket-Dan blast off right before the midway commercial break is cut. During the whole "Takeshi takes care of the Samehadaa" scene, Soko ni Sora ga Aru Kara is playing in the background in the Japanese version. And, as expected, 4Kids replaced the song with a bunch of their own background music. And while I'm on the subject, have you noticed how 4Kids' composer seems to have something against keeping any one piece of music playing for any longer than ten seconds? It feels like they're afraid that if the music isn't constantly changing, even within the same scene, that kids will become disinterested and turn away from the show. Is the country really so A.D.D. that we can't stay with one piece of music for any extended amount of time? Two seconds are cut from the panning shot right after the final commercial break. And a second is cut from the TO BE CONTINUED... screen.